I write this as we move into what is, for many of us, the biggest gift giving season of the year. Some of us are approaching the season in “business as usual” mode, some are looking at gifts and consumption in a new minimalist light, while still others are economizing based on need to do so. But, all of us want the gifts that we give to be enjoyed and appreciated. Everything I’ve done lately is marked by sentimentality and a sense of family. I’ve done a lot of looking back as Russ and I have been working to open our Six Degrees Store on Etsy. We’ve entirely rearranged the house, turning one bedroom into a studio, moving many things to the attic and making all of our spaces more artisan friendly. One thing I came across while turning my home upside down was a stack of my great grandmother’s aprons. We called her Grandma Pill. She wore an apron every day, all day. It was part of her uniform and she wasn’t dressed until she had it on. When I was a child, I taught myself to sew making clothes for my dolls. One day my grandmother, we called her Mimi, got out the pattern to make her some new aprons for Grandma Pill. 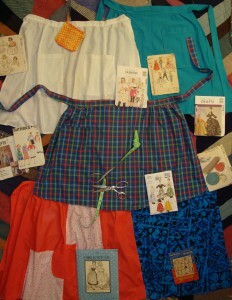 I decided that it was time to graduate to making gifts and I asked if I could sew Grandma Pill’s new aprons. Mimi granted my request, handed me the pattern and showed me some available fabric to choose from. The pattern was made of newspaper. It had evolved over time as Grandma Pill tweaked it now and then and it had been traced time and again as each new original became worn. It was plain, with just a little shape and one or two pockets. I wanted my gift to be special. I pulled out some of the fancy patterns that I had my eye on out from underneath the large oak buffet and suggested that I might make one of them. Mimi said “Well, you can make one of those if you want to, but if you’re making an apron for mother, you need to use this pattern because this is what she wants.” I was disappointed. I was still in Barbie doll land and Barbie is a fashion doll. Plain was not really what a little girl who was hoping to make something special really wanted to think about, but Mimi had a very certain tone in her voice and I wanted to make the apron, so I did what she told me to. I made a plain, ordinary everyday apron, at least I conformed to one as plain and ordinary as I could force my child’s yearning heart to handle, and it was exactly what Grandma Pill wanted. She was delighted. I didn’t learn any significant new sewing skills that day when I moved beyond doll clothes, but I did learn a lot about gift giving. We recently opened our Etsy.com store and it’s been a long time coming. Opening the “store” seemed a perfect idea. I’ve been collecting fine craft and sewing supplies for many years, but I had stopped using them a few years back. My empty nester house was filled like a craft store, closets and shelves overflowing. It seemed a perfect fit in our recent stint of unemployment. We had extra time and extra stuff and arts in crafts are in my blood, a family tradition. As long as we used only personal supplies that we already had, the risk would be time alone. We could make lemonade from our lemons. I guess we are not the only people to decide that crafting might be the solution. This week there was an audio spoof on The Onion, “80% of the Nation now selling handmade jewelry“. Though there is currently no jewelry in our collection, there’s nothing quite like seeing yourself parodied just as you are getting into something you’ve been working on pretty hard for a while, but in today’s age everything is spoofed and you’d better be able to see the humor, so I write this for others who may be considering doing something similar. There were several challenges in opening our new store, large and small, and the jury is still out on our attempt to make lemonade. Here’s are some examples of small: A serger is the machine that makes the overlock stitch you see on store bought clothes (especially stretchy ones). A serger comes with these nice bent tweezers that are very useful. They look like a dentists tool and they help you to thread the needles because fingers don’t fit very well between the knives that trim the fabric and the needles that pierce it. The problem is that these handy tweezers are useful for everything under the sun and actually keeping them in the serger tool door where they belong is a challenge that I am not always up to. I should have several pairs and keep them placed at strategic places around the house. Oh, and there’s the baby doll crib I’m working on. I need to use ribbon. I have a box with literally hundreds of spools of ribbon, but do I have the right color? The idea that there would be no risk but time, well that sounded good in theory. And the example of large? Well, that same Babylock serger that I bought when sergers were new to the home market was an experiment. It wasn’t just a threading problem, it stopped working altogether, just when I had a lot of Halloween stock underway and not much time to complete it. So here I am, in a rush and the sewing machine repair man is telling me that they didn’t know how to cast the metal when my machine was made. They used pot metal and if the machine sits for long periods of time it often ceases to function. I’m thinking “They knew how to cast engine blocks long before that, the knowledge wasn’t transferable?” Regardless of why they did it badly, they did, and I am the beneficiary of that unfortunate fact. The cost of the replacement part and service to install it was close to the cost of a new machine, so they stopped making the part. I had taken my Babylock to a non Babylock dealer and I did that for a very specific reason. I had come out on the wrong end of a repair in the past and didn’t want to support the dealer who had made me pay for their mistake. Still, this was information that needed confirmation. I swallowed, went to the local Babylock dealer and asked. The representative said “Sounds right” before moving into sales mode. The machine that would give the best value/cost trade off if my business takes off is a third higher than what I originally paid. I’m thinking of the no lose, no financial cost, only time investment decision that I made when I decided to start, and that was several unexpected costs ago. The decision to buy some type of serger seems pretty clear, at the same time, it doesn’t. When I get ready to buy, I remember that the machine I want comes from a dealer that I don’t want. The Etsy store has not progressed to the point where we know that we will make it a business rather than a hobby. I need the serger for most of the things I want to sew, but the decision to buy gets stuck in my throat. Now I’m looking at Christmas, I’m even looking at it late and still I can’t follow through to make the purchase. It’s more than the risk of spending a large sum of money when you started off with a no risk game plan. It’s deciding to give that money to a business that didn’t treat you well last time you gave them a couple of thousand dollars. There is the up side though. We really are having a blast imagineering. Creative pursuits are by far the most energizing (and agonizing). We are having fun collaborating, asking each other for second opinions. We get so excited when we make a sale. We’ll be beside ourselves if we ever make a profit and turn it into a going business. You’d think that we were 5 years old and really had made lemonade, selling it on the corner. And, we watch a lot. We are in a fledgling stage and trying to decide which of our talents to pursue. Kids in a candy store. We watch the Etsy Store page to see what people are looking at and try to decide which projects to prioritize. There is a whole community to the Etsy.com organization. People put together collections and interact in various ways. It’s an adventure and a journey and all those things that dreams are made up of. One of the reasons the idea has such appeal is the real dream. If it were to really take off it would be wonderful to build it into the idea that I wrote about in this story. We invite you to join us! Tell us what you like. Tell us what you’d like to see.